As wonderful as it is to fill your garden with plants and flowers, it’s also important to install an area for you to enjoy the fruits of your labour, as well as being a lovely decorative feature for your garden. Arbours and arches make a great addition to the garden both as a place to grow climbing plants and also to create height and interest. Arbours can be placed at the end of a path as a focal point or against an expanse of wall or fence to break it up. Arches make a statement at the entrance of a garden or over a path, especially when planted with scented climbing plants such as roses or Honeysuckle. They can also look very effective as a frame for a view or to highlight a mirror, ornamental pot or statue. Installing an arbour needn’t be arduous. Our simple tips for installation will mean you have a place of your own in the garden in no time. Bench – if you’d like somewhere to sit under the arbour! Once you have chosen the position for your structure, clear the area of any weeds and large stones, without disturbing the soil too much. Make sure that the ground is as level and firm as you can manage. Arbours are best erected onto an area of concrete, paving stones or decking. They can also be put up on firm earth and the area can be finished with gravel or ornamental chippings over a ground cover membrane to reduce the number of weeds coming through. Where there is an expanse of concrete or paving stones that cannot be lifted, bolt down post holders should be used to secure arbour posts. Ideally, arches should be put up on soil to allow climbers to be planted in the ground to cover the framework. However, many climbing plants are quite happy to be grown in large pots if your garden is in a courtyard. Remember to make your arch wide enough and high enough, so that you can walk through it easily, even when it is covered with plants. Leave enough room around your structure for maintenance work to be carried out easily. Wooden structures will need to be coated with fresh preservative every few years. 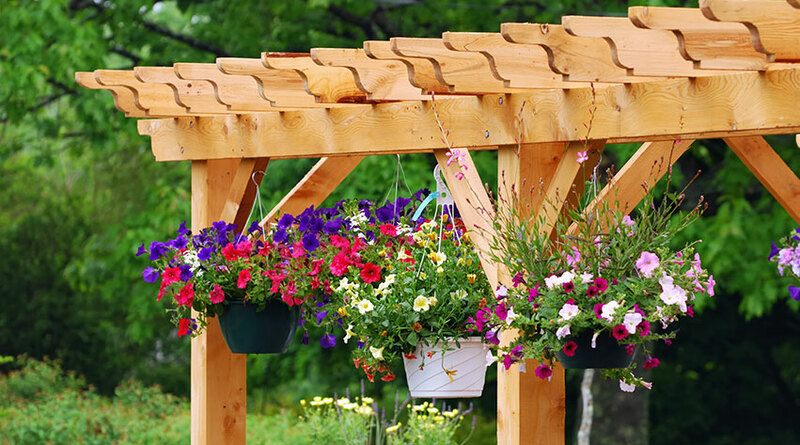 There are many structures available from your local garden centre in kit form, complete with instructions for assembly or you may choose to build your own from timber. Make sure that the timber used is treated to give it a longer life. It is easier to stain each piece with the preservative of your choice before you put it up. This way, each edge will be treated. Upright posts can be concreted into the soil using a ‘dry mix’ of cement and ballast, finished 5cm below the soil level, or fence post holders can be used. In very exposed locations, it is best to concrete uprights for arches into the ground. Bury a quarter of the post in the ground to ensure a solid structure and leave the concrete to ‘go off’ for 24 hours. Check that the posts are level. You may need to saw some wood from the tops once the concrete has set. Remember to treat any sawn wood ends with preservative. Add the cross pieces and finish with the side pieces. Screwing, rather than nailing the pieces together will create a stronger finish. Once you have put up your arbour or arch you will be able to plant it up with scented climbing plants to enjoy for many years to come.